Do you have diseased, damaged, dead or dying trees on your property? Is a tree in the way of an upcoming construction or landscaping project? Are you uncomfortable with the location of a tree or its proximity to structures on your property or your neighbors? Not sure if you’ve got a tree that needs to be removed? If so, Adirondack Tree Surgeons can help! Our team of skilled experts are trained in the latest techniques and methods for tree removal and have extensive experience providing residential and commercial tree removal services. We specialize in large, dangerous tree removal. Using state-of-the-art equipment and operating in strict adherence with industry safety standards, we can safely and efficiently remove any tree for any reason. Tree removal is a dangerous, complex process but with our experienced, professional tree care specialists, you’ll have nothing to worry about. Before beginning our tree removal services, we will carefully and thoroughly assess the site to identify any hazards or complications that may arise. We will determine the most effective, appropriate method of tree removal and note any specialized equipment that may be required to remove the tree or trees safely, without inflicting any unnecessary damage to the surrounding area. 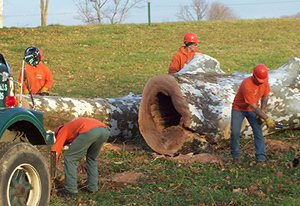 When removing the tree, our team will work carefully and efficiently, using advanced techniques and the latest tools and equipment to facilitate the process. Once taken down, we will ensure swift clean up of the trees and branches and even provide stump removal services. For clients interested in our commercial tree services, please visit our lot clearing page to learn more about the professional land and lot clearing tree removal services we can provide. With more than 30 years of experience providing tree service throughout Upstate NY and the Capital Region including areas such as Clifton Park, Malta, Ballston Spa, Lake George, Glens Falls, Saratoga Springs, Wilton and much more, we are well qualified to meet your tree removal needs. We are fully licensed and insured for homeowners protection to ensure peace of mind and let you know you are working with qualified tree service professionals. Contact Adirondack Tree Surgeons today for your FREE ESTIMATE or give us a call now at 518-792-2225.